Toronto, Ontario--(Newsfile Corp. - November 27, 2018) - Aurania Resources Ltd. (TSXV: ARU) (OTCQB: AUIAF) (FSE: 20Q) ("Aurania" or the "Company") reports that gold and pathfinder elements typical of epithermal systems have been detected in stream sediments from an area about 5 kilometres ("km") long in the Tinchi target in the Company's Lost Cities Cutucu project ("Project") in southeastern Ecuador. 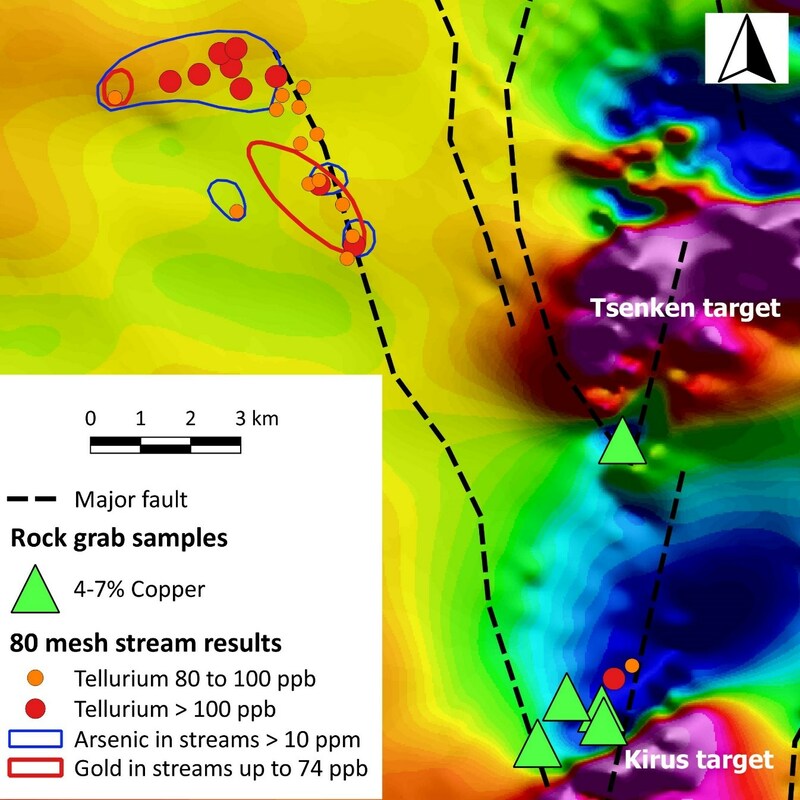 The Tinchi target lies along trend of the Kirus area in which high-grade copper has been discovered (see news release dated November 1, 2018). Aurania's President, Dr. Richard Spencer commented, "Many epithermal gold-silver deposits throughout the world have a close genetic relationship with porphyry copper or copper-gold deposits. A similar relationship is emerging that the new Tinchi gold target and the Kirus copper target are part of a single mineralizing system that lies entirely within the Project area. These deposits are often linked by fault corridors - conduits along which the metal-bearing fluids derived from the copper porphyries flow, evolve and cool to form epithermal gold-silver deposits." "The recognition of linked epithermal and porphyry systems confirms that we are in "elephant country" - it highlights the potential for the Project to contain very large deposits," said Dr. Keith Barron, Aurania's Chairman and CEO. "An example of a linked porphyry-epithermal system is the Far Southeast - Lepanto - Victoria system in the Philippines: Far Southeast is a porphyry that forms the core of the system and contained a resource of 27 million ounces ("Moz") of gold with by-product copper. Lepanto is an epithermal deposit from which a further 3.6Moz of gold was mined right on the shoulder of the porphyry, while the Victoria Veins on the other side of the porphyry, contained a further 2.5Moz of gold. This is the kind of system we are looking for." Gold occurs in streams draining an area approximately 3km long that is flanked by streams with elevated levels of pathfinder elements such as tellurium and arsenic at higher elevations from an area a further 2km long (Figure 1). Tinchi lies on the north-northwest-trending fault zone that bounds the Kirus copper target, from which grab samples of rock returned grades of between 4.3% and 5.4% copper and 48 to 79 grams per tonne ("g/t") of silver. The high-grade copper is in secondary minerals malachite, chrysocolla, tenorite, chalcocite and cuprite, and likely represents part of a secondary copper blanket as discussed in the Company's news release issued on November 1, 2018. The recognition of linked porphyry-epithermal targets represents a breakthrough in the exploration of the Project area since it dictates that precious metal exploration should focus on the structural corridors in which porphyry systems, conspicuous in the regional geophysics, were emplaced. This observation helps to focus the regional exploration work, which has now covered 35% of the Company's large, 2,080 square km project area. Additional stream sediment sampling will be undertaken to refine the area of enrichment of pathfinder elements and will be followed by ridge and spur soil sampling to better-define the location and shape of the target at Tinchi. Ridge and spur soil sampling and detailed geological work is underway at the Company's Yawi and Kirus target to prepare them for scout drilling.